She is the epitome of class and elegance. This morning, she appeared so calm. Almost peaceful. Very sophisticated. 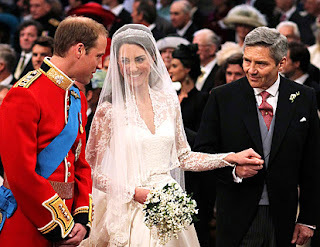 When Catherine met Prince William at the altar, you could read his lips as he said, "You look beautiful." I melted. Weddings make me tres emotional. I vividly remember being about 13 and thinking, "If I could just get to England and meet Prince William, I'm certain he would fall in love with me and make me a Princess." I daydreamed we would meet as I was touring the Castle (And I know Mom had the same grandiose notions about Paul McCartney. Like mother, like daughter.). Alas, I've never even been to England. No opportunity to sweep Wills off his feet. As was meant to be. I was destined to find someone even more amazing – my very own REAL Prince Charming – at another beautiful wedding in Midland, Texas, almost four years ago. But an official title doesn't stop me from feeling like a Princess each and every day. And y'all know I've got that Queenly parade wave down. Now I just need an "official" tiara! Mom and I reminisced about my wedding last year as I drove to work this morning. I thought it might be fun to share a few details and pictures with y'all! Thank you for humoring me. Hubby and I were married at "half past ten in the morning." Very Royal chic, right? LOL. It was a fabulous Spring day. A little windy, but the sun was sparkling. Hubs and I chose to see each other before the ceremony. My Dad walked me to him – down the aisle – in the Chapel. It was a special and intimate moment we'll always cherish. Our "Officiant" was the remarkable man that introduced Mom and Dad over 34 years ago. He's my Dad's best friend. It meant the world to me to have him pronounce us as "husband and wife." After the ceremony, our guests were invited to the Courtyard for cocktails and hors d'oeuvres while we took a few family pictures. Everyone then moved into the Ballroom for a lunch reception with a "vintage garden party theme." We served Kobe beef burgers and black pepper French fries. Yummy. There was laughter. There were tears. Dancing and toasting. It was like a dream come true. Dad had arranged for a Rolls Royce to drive us away from our wedding that afternoon. I wouldn't have traded that fantastic surprise for all the horse-drawn carriages in the world. A magical ending to the happiest day of my life. You are the star of each night. You are the brightness of every morning. You are the story of each guest. You are the most important part of my heart. You are the face of my sun. You are the harp of my music. You are the CROWN of my company. To the Duke and Duchess! Cheers! I mean, what could be better than burgers and fries? Oh, except wedding cake, of course! Thank you, sweet Autumn! That is such a huge compliment. You just made my day. Smooches.